Medical Barrier Cream helps improve skin health, making it ideal for dry, scaly conditions such as atopic or extremely sensitive skin types. Provides optimal hydration and repair following resurfacing procedures. This therapeutic product is ideal for skin that is resistant to the sensitizers and preservatives found in standard moisturizers. Apply daily as needed. For post-procedure care, follow application instruction from your skin care expert. I've always struggled with sensitive skin and this cream has helped soo much. When my skin looks like it is getting too dry from the summer sun, I put this on before bed and wake up with replenished skin. I love it! A little goes a long way. This is by far the best moisturizer I have ever used, and I find that it works on the whole body, whether on the face, elbows, hands, feet, etc. 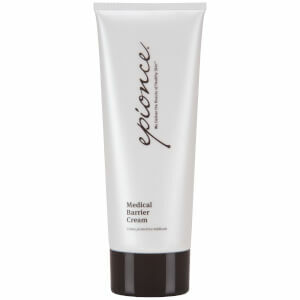 I haven't found another moisturizer that resolves dry heels, elbows and knees quite like Epionce Medical Barrier Cream. Even on the face it works wonders when I need an extra moisture boost without clogging and breaking out my at times sensitive, oily/combination skin. Also, I'm currently using a retinoid cream that causes dry, flaky, irritated skin, and I find that this product resolves these issues effectively as well. I am currently repurchasing this product for the 4th time to avoid getting stuck without it!